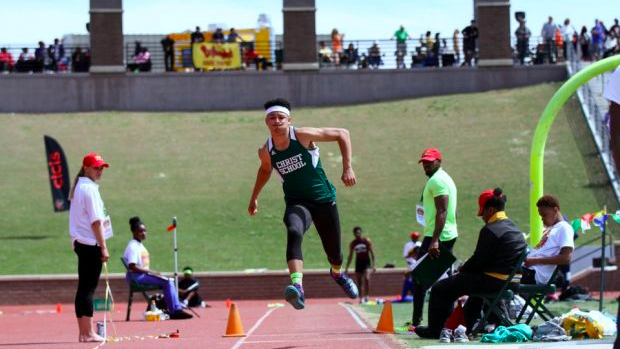 Kevin Snyder (Christ School) was the NCISAA 3A Long & Triple Jump State Champion as a sophomore. Last weekend Snyder opened up his season at the Champion Fast Track Invitational, and had a huge day in the Long Jump with a best mark of 23-9.75. This mark is good for a new NC#1 by 10 inches, current US No. 4 and NC No. 12 All-Time Indoors. Synder will head up to the VA Showcase to face off against an elite long jump field including current US No. 1 Donovan Louis (Potomac, VA) and US#2 Frank Royal (St. Christopher's, VA). Check out our Q&A with Snyder below. These meets will be LIVE on FloTrack both Friday and Saturday. Sign-up now for the broadcast to view all this action non-stop this weekend. WATCH LIVE. NCRunners: You had a huge sophomore year winning the NCISAA 3A Long and Triple Jump State Championship. What was the excitement and motivation for the future. Snyder: I knew winning state was good and all but I had bigger goals such as NBN and the National junior team for long jump. But my goals got set short with straining my hamstring twice this summer and not able to jump the whole summer for junior Olympics. Huge season debut last weekend. 8 inch Long Jump PR, NC#1, US No. 3 and NC No. 12 All-Time Indoors. Is that something you were expecting in the first meet of the season? Honestly It was a mixture of both, because I knew I've trained hard all summer to make a come back and due to meets being canceled due to weather I was waiting on my first meet for forever. I know this is only the beginning and I have a lot more to give. Have you been doing something different in practice that led to this big performance over the offseason? I've just been trying to make a come back from my injury's. Being in the weight room every morning last summer at 7am trying to get stronger and faster. Also, I've grown more and my body has developed more. Also, I've just been doing more plyometrics workouts and staying in the weight room. After jumping 23-9.25, do you reevaluate your goals for the season? Most definitely, I feel like I should be consistently jumping 24 feet and then finish my indoor season with a mid 24 and finish as an all-American. How did you get into track and when did you realize you could be a really good horizontal jumper? I stared back close to 6/7 grade and I knew I would be good when I was jumping over 20 feet my 7th and 8th grade year. I didn't start triple jump until my freshman year and just got serious about it last season. Christ School is an All-Boys Boarding School in Arden, NC. What's the biggest difference in Christ School versus a normal public or private school? Honestly, it's such a big difference just with how much the teachers help you and want to actually help you. Then the head master Paul Krieger just make the school fun for all the students and builds relationships that not everyone can have. Also, another big facts is it being an all boys school and I can focus on my work more and not girls. Huge weekend coming up for you at the VA Showcase. US No. 1, No. 2 and you at NC No. 3 are heading to the meet for Long Jump. Are you excited to test yourself against the best jumpers in the US? I've always lived for the big moments and this weekend for sure will be one. I know this will be a best test for me and almost like a pre NBN meet. Being the VA showcase is my second meet brings a lot of pressure this week for preparation to fix all the small things so I can pop off a big jump. I know them being US#1 and #2 and then me at #3 will push me to jump better and I'm just excited and blessed to get this opportunity. What's your goal for this weekend in the long and triple jump? My goal is to win and then hopefully to top there ranked jumps to become either U.S #2 or #1. I'm just going into this track meet tying to get my legs back under me and learn more about myself as a jumper and how I can make myself better. Most importantly is to put my name out there to the colleges and one day fulfill my dreams and become an division 1 athlete.